Summary: Two types of balloon are usually employed to perform balloon-assisted coil placement in cerebral aneurysms: oval, guide-dependent balloons for sidewall aneurysms and round balloons for bifurcation aneurysms. We report on the use of a new, more compliant, guide-dependent oval balloon microcatheter to seal wide-neck bifurcation aneurysms with coils during endovascular occlusion. The standard coil embolization technique is limited by its inability to occlude wide-neck aneurysms. The balloon-assisted, so-called remodeling, technique consists of the temporary inflation of a balloon across the aneurysm neck during embolization to avoid inadvertent coil protrusion into the parent artery (1); however, wide-neck, sometimes complex, aneurysms located at arterial bifurcations are poor candidates for endovascular treatment, even if the remodeling technique is planned, because coil protrusion may preclude the patency of arterial branches close to or away from the neck of the aneurysm. For these lesions, the remodeling technique remains challenging. We report four cases in which the use of a new, more compliant balloon (Hyperform; Micro Therapeutics, Irvine, CA) (Fig 1) allowed the treatment of complex, wide-neck bifurcation aneurysms for which the standard embolization technique would not have permitted safe endovascular occlusion. Compliance is a mechanical property defined by the propensity of the balloon to change its cylindrical shape to the anatomy of the vessel in which it is inflated. The use of a regular and less compliant balloon would not have conformed to the anatomy of the four bifurcation aneurysms described in this technical note. Sketch of the Hyperform balloon microcatheter illustrates sealing of the aneurysm neck and both bifurcated branches. All four patients underwent endovascular occlusion for cerebral aneurysms under general anesthesia and full heparinization (5000 IU heparin followed by continuous infusion [2000–3000 IU/h]) to maintain the activated clotting time between 200 and 300 seconds. Two patients had incidental aneurysms and were given intravenous aspirin (250 mg) at the beginning of the procedure. Preoperative cerebral digital subtraction angiography (Integris Allura; Philips Medical Systems, Best, the Netherlands) included a high-resolution, three-dimensional rotational study in all cases. Bifemoral accesses were carried out in all patients to allow the placement of two 6F guiding catheters (Envoy; Cordis, Miami Lakes, FL). A, Right internal carotid artery (ICA) angiogram, best projection, shows the MCA bifurcation aneurysm. B, Three-dimensional image of the right MCA bifurcation aneurysm shows the upper trunk (white arrow), the lower trunk (arrowhead), and the M1 segment (star) of the MCA. The lower trunk is clearly emerging from the neck of the aneurysm. C, Radiograph of the inflated Hyperform balloon into the MCA bifurcation. The balloon is bulging into the origin of the upper trunk (arrow), and its distal tip is positioned in the origin of the lower trunk (arrowhead). The Silver Speed (Silver Speed 10; Micro Therapeutics) guidewire is secured distally into the posterior temporal artery (open arrow). D, Right ICA control angiogram acquired at the end of the procedure shows total aneurysm occlusion and patency of upper and lower MCA trunks. A 53-year-old man, who initially presented with a headache, was referred to our department for treatment of an unruptured right middle cerebral artery (MCA) bifurcation aneurysm. The lower trunk of the MCA arose from the aneurysm neck. Embolization and clinical follow-up were uneventful. The 6-month follow-up angiogram showed persistent and complete occlusion of the aneurysm. A, Left ICA angiogram shows a bilobulated MCA bifurcation aneurysm (arrow). B, Three-dimensional angiogram shows the wide-neck aneurysm. The upper trunk origin appears dysplastic and enlarged (star). The lower trunk is indicated by the arrow. C, Radiograph of the inflated Hyperform balloon. The balloon bulges into the origin of the upper trunk (thin arrow), and its distal tip is positioned in the origin of the lower trunk (arrowhead). The Silver Speed guidewire is secured distally into the posterior temporal artery (thick arrow). D, Left ICA control angiogram acquired at the end of the procedure shows total aneurysm occlusion, with patency of both MCA upper and lower trunks. A 54-year-old woman was admitted to our institution with a Fisher grade III subarachnoid hemorrhage secondary to the rupture of a 3-mm-diameter left MCA bifurcation aneurysm with a 3-mm neck. The patient had no focal neurologic deficit at the time of admission. The aneurysm was completely occluded after coil placement, but the control angiogram disclosed a nonocclusive thrombus at the origin of the left posterior temporal artery. This thrombus completely disappeared 20 minutes after local injection of 4 mg of abciximab (Reopro; Lilly-France, Saint-Cloud, France). The patient’s neurologic status remained unchanged, and she was discharged home 2 weeks after the procedure. The 3-month follow-up angiogram showed the persistence of the aneurysm occlusion. A, Right ICA angiogram, best projection, shows the MCA aneurysm with the upper trunk (arrow) emerging from the sac. B, Right ICA angiogram, best projection, shows the Hyperform balloon inflated into the right MCA. The proximal part of the balloon is bulging into the origin of the upper trunk (arrow). C, Right ICA angiogram acquired at the end of the procedure shows that aneurysm occlusion is partial to preserve the patency of the upper trunk. A 29-year-old woman was referred to our institution for endovascular treatment of an unruptured right MCA bifurcation aneurysm. 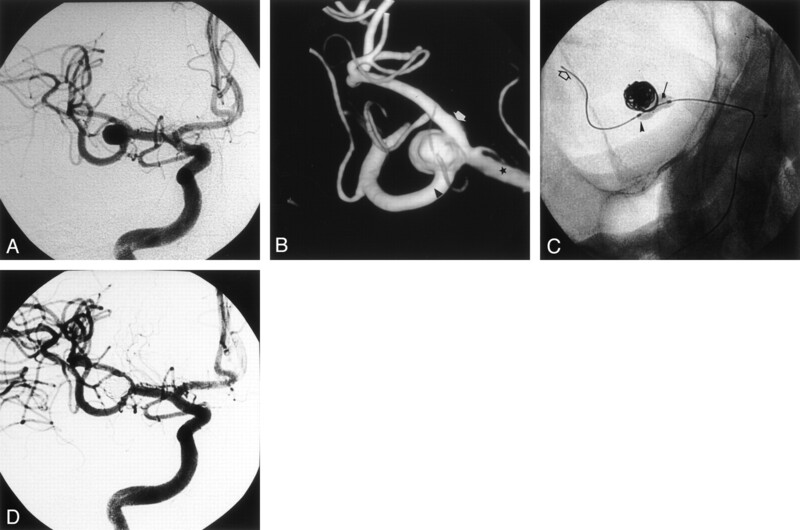 Three months before, two unruptured left MCA aneurysms had been endovascularly treated. Consequently, this patient was scheduled for the endovascular treatment of a right MCA aneurysm. Three-dimensional angiography revealed the upper arterial trunk of the MCA emerged from the proximal part of the aneurysmal sac. This second procedure was uneventful, and the patient’s neurologic status remained unchanged. A, Left vertebral angiogram, best frontal projection, shows the basilar tip aneurysm with unfavorable neck-to-fundus ratio. B, Radiograph of the inflated Hyperform balloon. The balloon is inflated across the neck. The distal part (thick arrow) of the Hyperform balloon is positioned into the left P1 segment, and its proximal part (thin arrow) is positioned into the basilar artery. The balloon conforms easily to both diameters of the basilar and the P1 segment of the left posterior cerebral artery. C, Left vertebral angiogram acquired after the procedure shows occlusion of the aneurysm with patency of both P1 segments. A 47-year-old man was referred to our institution for endovascular treatment of a recently ruptured basilar tip aneurysm. Because of the width of the aneurysm neck, endovascular treatment was conducted with the remodeling technique, which allowed total aneurysm occlusion with coils. The patient’s neurologic status remained unchanged after the endovascular procedure. At the onset of the Guglielmi detachable coil procedure, it appeared that total aneurysm occlusion could be achieved in 85% of cases if the aneurysm neck diameter was smaller than 4 mm. Only 15% of wide-neck aneurysms could be completely occluded (2, 3). Later, the remodeling technique enabled treatment of wide-neck aneurysms and reduction in the size of aneurysm remnants after coil placement. Consequently, this technique improved the persistence of aneurysm circulatory exclusion with denser coil packing (1, 4). 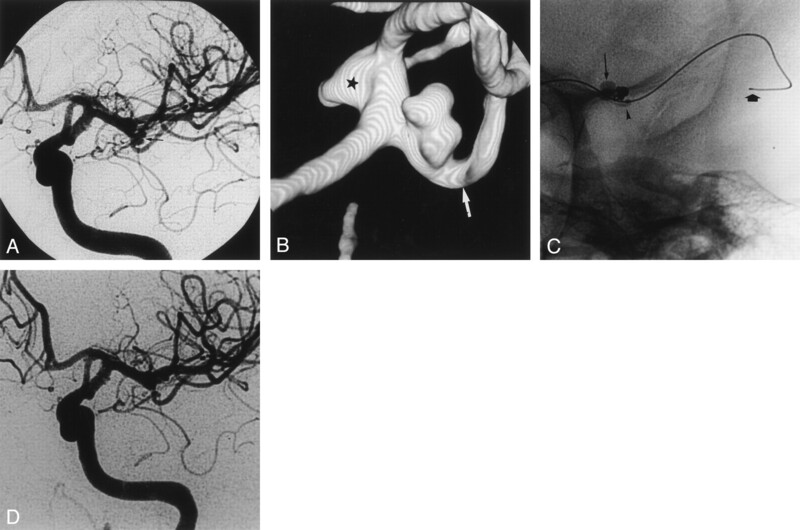 The introduction of three-dimensional coils in 1998 and the subsequent development of complex-shaped coils were also milestones in the treatment of wide-neck aneurysms (5). Despite these adjunctive techniques and new devices that increased the number of aneurysms amenable to endovascular treatment, aneurysms located at arterial bifurcations with complex anatomy remain challenging for endovascular treatment. A neck-bridge device (Trispan; Target/Boston Scientific, Fremont, CA.) has recently been proposed to facilitate treatment of these complex aneurysms (6); however, the device is sometimes difficult to position adequately and does not allow treatment of aneurysms with diameters less than 10 mm. 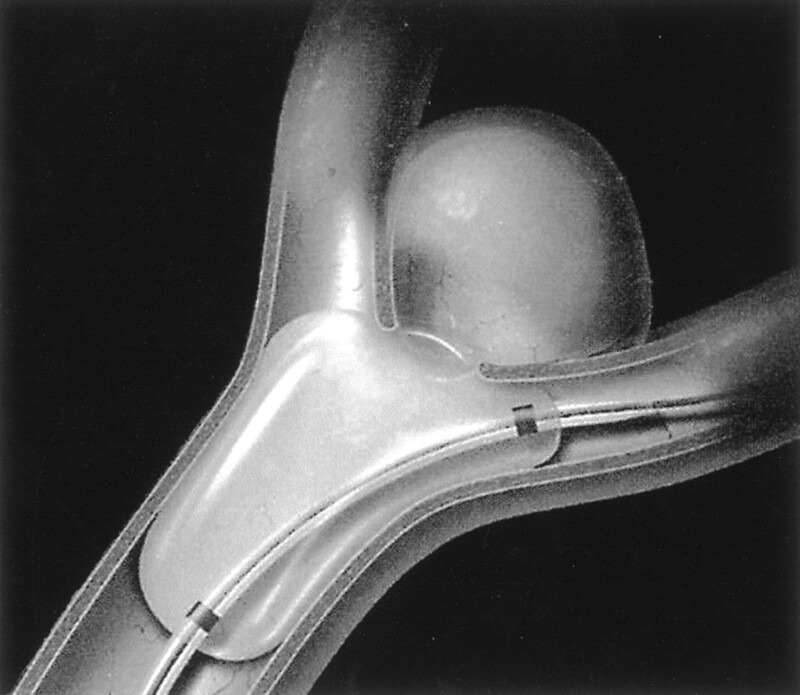 The “classic” remodeling technique, using a single low-compliance balloon, is limited to sidewall aneurysms, and is inadequate for protection of both the neck and arterial branches of complex bifurcation aneurysms. At our institution, the alternative treatment of wide-neck bifurcation aneurysms has been the use of a compliant latex balloon (B1; Balt, Montmorency, France) glued to the tip of a flow-dependent microcatheter (eg, Spinnaker; Target/Boston Scientific). The round shape and high compliance of such a latex balloon conforms easily to the arterial bifurcation; however, the flow-dependent characteristics of the microcatheter make stabilization of the balloon in the correct position sometimes difficult. The Hyperform is a very compliant nonlatex balloon that is more effective in the treatment of bifurcation aneurysms, because it is easier to attain an adequate position than that attained with the round latex balloon we used previously. Its suppleness protects asymmetrical vasculature by forming nodes into surrounding arterial branches; the balloon easily changes from its initial cylindrical shape to bulge into the origin of the arterial branches emerging from the aneurysm neck. Other over-the-wire balloons like the Sentry (Target/Boston Scientific) or the HyperGlide (Micro Therapeutics) are routinely used in our department to perform balloon-assisted coil placement in wide-neck sidewall aneurysms. On the other hand, because of their lower compliance, these balloons do not have the propensity to adapt to the anatomy of arterial bifurcation. These balloons are usually better suited for assisting the coil placement in aneurysms of the carotid siphon. Their lower compliance protects the aneurysm neck without the balloon bulging through the neck of the aneurysm. Along with perforation of the aneurysm, thromboembolic events constitute the main complication of aneurysm coil placement. The risk of thromboembolic complication is supposed to increase with the remodeling technique because of the adjunction of more devices into the arteries and of the temporary occlusion of the parent vessel (7). In Case 2, a thrombus appeared in the branch where the distal tip of the Hyperform balloon was navigated. Fortunately, the local infusion of abciximab dissolved the clot within a few minutes. The Hyperform balloon microcatheter allowed us to treat all four bifurcation aneurysms that had an anatomic configuration considered unfavorable for coil placement with the standard technique. Accepted after revision February 9, 2003.